Yeast extract is a natural ingredient that is made from yeast, the same yeast that is used in bread, beer and wine. Yeast extract has a savoury flavour that is comparable to a bouillon, which often makes it a suitable ingredient for savoury products to add and bring out flavours and taste in these products. Yeast is the basic ingredient for yeast extract. Enzymes break down the proteins into their taste delivering parts: this is yeast extract. In which foods is yeast extract used? Yeast extract is used in the majority of savoury products available in the supermarket. Many popular sauces, bouillons, meat dishes, ready-made meals and savoury snacks are refined with yeast extract. Yes, although the taste is redolent of a meat bouillon, yeast extract does not contain animal ingredients and is therefore suitable for the vegetarian cuisine. How much yeast extract is used in our food? Yeast extract has a strong taste of its own. Therefore it is used only in very small quantities. Just a small amount already leads to very good results in terms of flavour and taste. The concentration of yeast extract in dishes is usually less than 1%. Is yeast extract a flavour enhancer? Yeast extract is a natural ingredient and not a flavour enhancing additive. Flavour enhancers such as monosodium glutamate (MSG) are generally single substances which have no taste of their own, but make existing flavours stronger. They are ranked among additives and are therefore labelled with an E-number (E 620 - E 640) in the ingredient list. 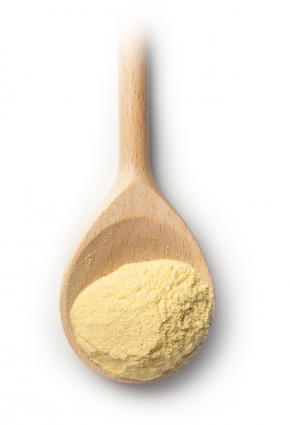 Yeast extract is a rich composition of amino acids, carbohydrates, vitamins and minerals. It naturally contains glutamate, as do tomatoes, peas, mushrooms and cheese for example. Yeast extract has a natural glutamate content of typically about 5%. If yeast extract is considered a flavour enhancer than also tomatoes, peas and parmesan cheese are flavour enhancers. Does yeast extract contain glutamate? Many fresh products naturally contain glutamate. We find it in tomatoes, peas and mushrooms. Glutamate also is one of the many natural components of yeast extract. Even our body produces glutamate. Regardless of the food we consume, it is found in our saliva and breast milk. Yeast extract has a glutamate content of typically about 5%. One tomato for instance provides twice as much glutamate as a cup of bouillon made purely of yeast extract. How is yeast extract labelled in the ingredient list? Yeast extract is labelled as “yeast extract” in the ingredient list or sometimes included in “natural flavour”. These names are based on the requirements of the European Food Law. Yeast extract is a natural ingredient that consists of many taste providing components. The unique savoury taste is the main reason why food producers add it to their products, just like you would use herbs and spices to add flavour to your food. Flavour enhancers like MSG fortify the taste impact of the flavours present and are therefore labelled flavour enhancer. The tags refer to the fact that yeast extract is a 100% natural ingredient and flavour enhancement is not its main characteristic.